Author Julia Ibbotson and her husband glimpsed the old Victorian rectory on a cold January day. It was in dire need of renovation, in the midst of the English moorlands and a mile from the nearest village, but they determined to embark on a new life in the country, to make the sad neglected house glow again and to settle into the life of the small traditional village. 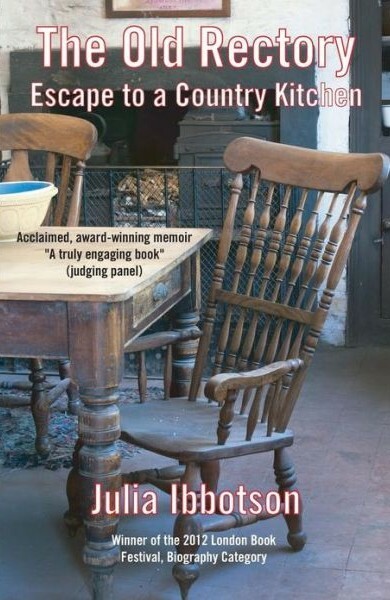 As Julia researches the history of the house and village, supervises the renovations and cooks for family and friends, she records their journey. This real-life, award-winning account focuses on the quest to “live the dream” and, in the end, to find what is important in life. As the book foregrounds the centrality of the kitchen as the pulse of the family and home, each chapter ends with delicious but easy recipes, both current favourites and those from the historic period unfolding within the chapter: Victorian, Edwardian, wartime and present day. Reviewers have been fulsome in their praise, including “ enchanting”, “a talented writer”, “charming story”, “delightful”, “a jewel”, “ a great writer”, “inspirational”, “truly engaging”, and “destined to become a classic”. I loved the visual imagery that Julia gave for the Rectory. Without photos it would be very hard to picture in ones eye the look of the Rectory as they saw it for the first time and including all of the renovations. And of course the surrounding area complete with roaming roosters! The only thing that would make this book better would be photographs, but I know that is so costly in a book. I looked on her website and FB page and couldn't find any immediately. I think that would be a great asset for readers of the book. The recipes sounded amazing! I don't think I could make most of them as they were unique and gourmet, something my family would frown on.... but if it is ever hubby and I, we may need to try our hand at some of these wonderful recipes. The recipes really added to the feel of the story, the country kitchen aspect of the rectory. I want to come and visit and peer in all of the corners of the house! Julia really was able to draw you into the warmth of her kitchen and the charm of her home! Fantastic job. This sounds like a great tale of a real life history of an old rectory. I would like to read it. I do agree with Melanie that pictures are always good in true stories, and am disappointed that none were included! Thanks for the wonderful review, Melanie! 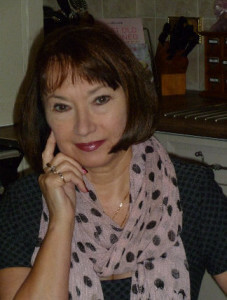 I'll have to get in touch with Julia and suggest her add photos of the experience on her blog, wonderful idea! Hi Melanie, thanks for hosting me today and for the lovely review! 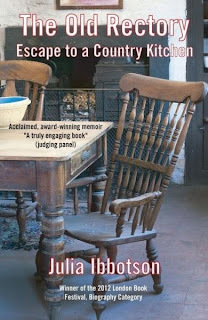 If you go to my website at www.juliaibbotson.com and click on the link to The Spirited Woman guest blogs you will find photos of the rectory! Also on my facebook page in "photos"! Also in the book, my daughter provided line drawings of the rectory in the book at the front and also at the head of each chapter - did you see these? Enjoy looking! Oh - another thought - also on my pinterest site under "The Old Rectory"! Julia I am wondering if your FB page photos are set to private as I can not see any other than your profile and cover photos and there are none of the rectory.